In the early 1960s there was a curious collaboration between the Cuban and Russian film industries resulting in an extraordinary movie called Soy Cuba (I am Cuba). The director was Mikhail Kalatozov, famous most probably for The Cranes Are Flying in 1957, and the director of photography was Sergey Urusevsky. The film is a cinematic tour de force, featuring several long single-take sequences which almost defy attempts to work out just how they were done. This motion picture interests us at Infrared 100 because much of it was shot using infrared film, with characteristic bright foliage and dark skies. The background to this was explained by members of the crew in a Brazilian documentary about the making of Soy Cuba, and called the Siberian Mammoth, a reference to the film being lost and overlooked for many years. Urusevsky wanted the film images to be a synthesis of Cuba. Each individual frame should shine like a sugar crystal, transforming the green of palm trees and sugarcane into tones of silver. To capture the Caribbean light he used an infrared negative which at that time was restricted solely to the use of the Soviet army. It took me several months to go from Moscow to the city where the film negative was made. It was made in a factory that produced military material. It was made in the same factory that produced the negatives for filming the other side of the moon. The infrared film creates a very strong visual effect which is difficult to control. The trick here is that the negative is panchromatic. Some chemicals are added to make it more sensitive to infrared light. While the pace of the film can be slow at times, there is no doubting its power. If cinematic gems appeal to you I recommend you check it out as the DVD is available, although you need to get the deluxe edition to see the documentary as well. More background is in the Wikipedia entry and some extracts and a trailer are available on YouTube. I have to admit that Soviet infrared film is a bit of a blank for me. Apart from a colour infrared film tested by NASA, I have not seen any references to actual types. It would be fascinating to see the negatives of this movie and find out just what this stock was called. I will be discussing the movie and showing a brief extract at the Broadcasting with InvisibleLight session at IBC/Amsterdam on September 13th. A quick diversion from infrared photography to Infrared Luminescence (aka fluorescence). This can be used to reveal faded writing on old and damaged documents, and for other forensic things. I recently discovered a somewhat elderly but fascinating article by the legendary Andrew Davidhazy (of Rochester Institute of Technology in the States) explaining a do-it-yourself approach to this. Usually you need an expensive infrared-blocking filter over the broad-spectrum/white light source and an infrared-pass filter over the lens. Also usually, if you try and take an infrared photo under fluorescent lights you get almost nothing but noise. Andrew points out in this paper that the average fluorescent light bulb (which presumably includes a lot of those low energy bulbs now prevalent) has a strange spectrum, attuned to our vision, which includes (virtually) no infrared. So if you illuminate your document with this and have an infrared-pass filter over your camera lens, all that will get through is infrared resulting from fluorescence in the document. The light, which includes no infrared, causes some of the document to fluoresce at a longer wavelength and some of that gets through the infrared filter. I have always been sceptical that the infrared photographs included in Professor Wood's 1910 RPS paper (presented on Tuesday September 27th 1910 and included in the Photographic Journal for October) were the oldest such images published. Now, following a trail suggested by Johns Hopkins University I read an early 1910 paper by Wood on The Moon in Ultraviolet (Popular Astronomy February 1910) in which he refers to his infrared landscape photographs as being of "little scientific value" and says he will explain more in a forthcoming article in the Century Magazine. 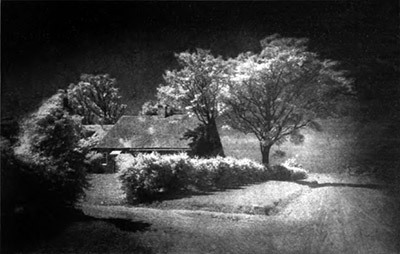 These were taken the previous summer (1909) and might be the infrared landscapes referred to in Wood's biography. [Later: no they're not; those were in 1908 and were shots of mountains] If you'd like to read the full article you can find it here in the Hathi Trust digital library. Go to page 565 and read on.